Hello everyone! Today I was wearing frilled leopard print skirt from Zara, with a fuchsia patterned jacket from Primark, a small golden clutch from Carolina Herrera, and patent black and gold heels from Miu Miu which I adore. Our blog is growing everyday and we thank you all for you lovely comments and for following us! Olá a todos! 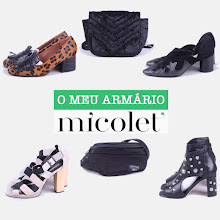 Hoje estava a usar uma saia de padrão leopardo com folhos da Zara, com um casaco de cor fúcsia da Primark, uma pequena carteira da Carolina Herrera, e uns sapatos patentes pretos e dourados da Miu Miu que adoro, O nosso blog está a crescer diariamente e agradecemos a todos pelos vossos comentários simpáticos e por nos seguirem! Love everything! And your shoes are amazing! Great photo! Beautiful pink jacket! I follow back to the GFC. Thank you :) We're now following you via Bloglovin' too! THIS JACKET IS FROM PRIMARK!? NO way! I love it and need one asap! P.s. your whole outfit is awesome. Que sapatos lindos!!! Adorei, adorei, adorei!! Great outfit! Super pretty! I followed you back on GFC, Bloglovin and Facebook (with profile name: Evi Fashionholic)! Thank for your comment, i follow u too because i loe your style! The jacket and the skirt are gorgeous! Aww, so darling. Love the heels. Uhm, is this for real? I just cannot believe that you're blog is this good! Hope you can check out mine sometimes. What an amazing blog! Love your style! I'm bound to bookmark your blog so I can read it more frequently! I'm your newest Blog fan :D Happy day to you! u look amazing!! and those heels are LOVE!!! omy!!! because of this look, leopard and hot pink might me my favourite combo!!! :D you look so posh and chic!! Stunning outfit..those heels are killer! Adorable look! Love the pink colour! You are too cute! I'm following you back :) keep in touch! Love the blazer and skirt. We kind of have the same skirt! Haha I got it from zara too. Im your new follower, hope you could follow back! Thank you Lea!! I love this skirt :) We're now following you! Wow! Super I have the same skirt! Well combinable thing! Followed you on blogloving and don`t find gfc link, if you want we can follow each other here in our blogs, if yes let me know! Greetings from Moscow and nice day! Thank you Bee Tee :) I'll check it out now! Amazing look! Your pink jacket is just perfection! Love your styling! thank you so much for following me darling.. love your style..
this pink blazer and leopard skirt combination are killing me!! Really cute blog and lovely outfit! Nice outfit!! I love the bag and the shoes!!! This outfit is really gorgeous!!! Love the shoes!!! We follow you back on gfc! What about following on Bloglovin and Facebook too?Let us know!! Thank you Francy & Stef! We follow you back on Bloglovin and Fb! love the contrast of colours ! Hey sweety. I am in love with those miu miu's! Thanx for your comment on my blog! Of course I would love to follow! Nice outfit. Love your blazer!! kisses and thanks for the comment!! Lovely outfit! Here I'm following you back. Following you girls! Love the blog. you're looking gorgeous in that outfit. I love your blog and I just followed it. thanks for droppin by my blog dear.. just followed you via gfc.. how about in bloglovin? Thanks, we're now following via bloglovin too! Un look genial. Me encantan los zapatos. Just became your 181st GFC follower! Those shoes are beautiful! Cannot believe you got that jacket from primarks, you look amazing!! Thanks you Jane :) I can't believe it neither! Obrigada por seguir o meu blog :) Segui de volta! Lindas as fotos e eu adorei o look principalmente o casaco! Thank you so much for your sweet comment, hun! Your blog is awesome! I'd be really glad to follow you:) i hope u'll follow me back on bloglovin!! Just followed you back. Thank you for visiting, stay in touch! Me encanta el look, la falda muy bonita! Beautiful! love the jacket and the shoes! You look warm,yet bright and beautiful! I love it!